What's the best place for a family or a group of people to gather and talk, read, watch TV, or play games? The answer is a Family Room. This multi purpose room is highly popular and it is in growing demand for families of all ages. 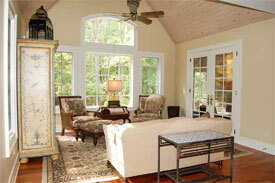 So what do you do, if you do not already have a great family room? The answer is, you build a Family Room Addition. At Simply Additions we help people with getting answers to questions about Family Room Costs and who to hire in their local area that can handle building the project with ease. Get the contact information to 3 room addition contractors that can do a good job on your family room addition project, by filling out the simply form below, or email us if you have questions. Get started with our award winning service that we developed for homeowners in need of professional advice and service.